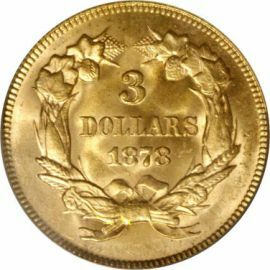 Three Dollar Gold coins were approved through Congress by the Act of Feb 21, 1853. They were created with the assumption that people would purchase more three cent stamps and silver three cent coins in roll quantities. Unfortunately, this did not happen and it spelled disaster for these Indian head gold coins and three cent nickels in 1889. Accroupie. Liberty is wearing a feathered headdress of equal sized feathers. The headdress also has a band with "LIBERTY" in raised letters. She's surrounded by the inscription "UNITED STATES OF AMERICA". The reverse of the coin shows a wreath of tobacco, wheat, corn and cotton. Surrounded by the wreath are the date and the denomination 3 DOLLARS. 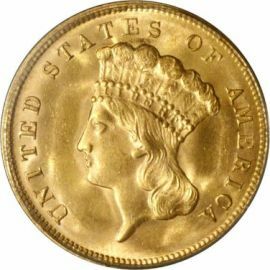 There are two very different reverse types, the small "DOLLARS" appearing only in 1854 and the large "DOLLARS" on coins of 1855 to 1889.